So beautiful and such a large space! Gorgeous! I can see why Lindsay is swooning!! What a beautiful and relaxing space! It's gorgeous! 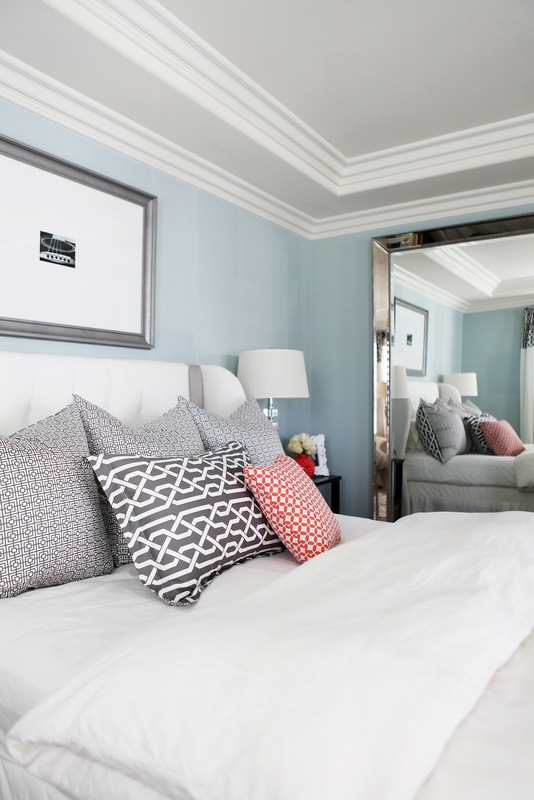 I love the bed and the pillows and that mirror is fab, too!! I love this room! So fresh, calm and relaxing! That headboard is fantastic! Wow! You did an outstanding job and so nailed it with the vibe you are after....fabulous in every way!! Gorgeous bedroom! So soothing. 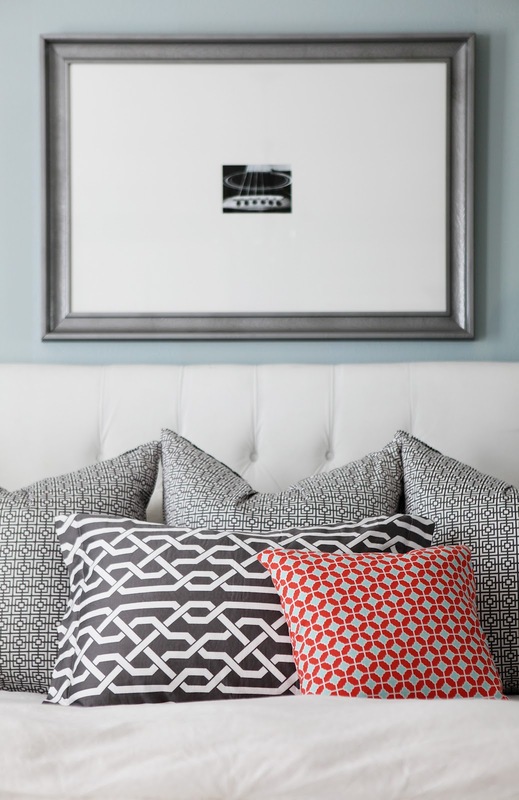 Quick question- where did you find your beautiful headboard? I'm on the hunt! Oh my gosh, her bedroom is stunning. 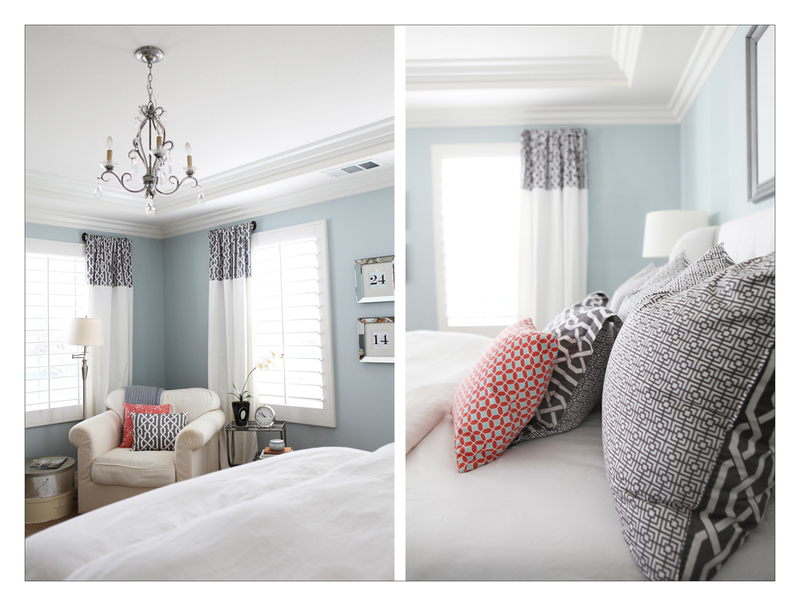 I love all of the blue & gray with pops of pink in the books & pillows. Beautiful! :) Thanks for sharing! Oh, so fun to be here, Lindsay. Thank you for the sweet comments. Rachel, the headboard was a total score from Target. Someone had returned it from online. It wasn't the right size so we customized it with the gray side panels to enlarge it. Can you tell us your paint colors? I'm especially interested in the blue. Thank you!! Wow! this is so beautiful! 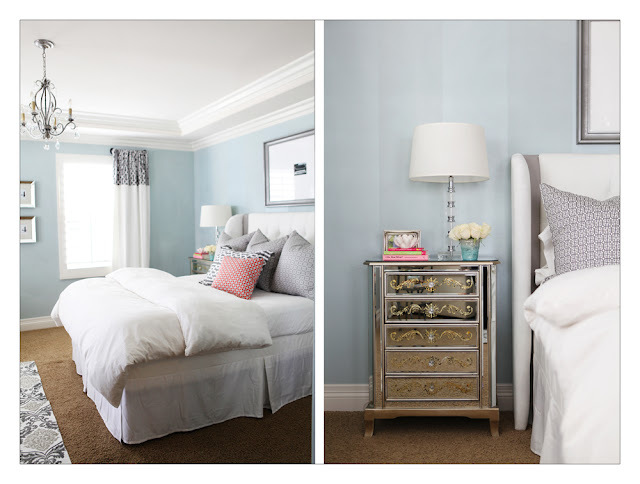 Will you please come style my room? Beautiful room Courtney! I love everything in it! It's a beautiful, relaxing room. I really love the art over the bed. Hi Anonymous! The wall color is Smoke by Benjamin Moore. Thank you to all of the S + S readers for such kind comments. What a gorgeous bedroom, love it! 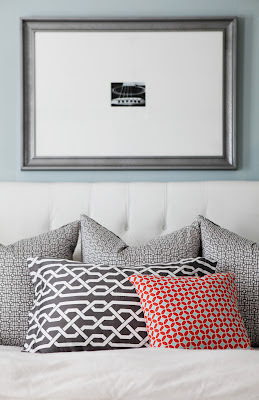 So a little plug for Courtnry because she is seriously amazing - she has a design service that can help you make your room look just as amazing! I only know her from using her twice to help me design my rooms. I saved so much money (she respects a thrifty gal) and no mistake purchases (you know the curtains you swear you love and three months later don't)! Anyhow just wanted to share because I thought my bedroom would be impossible to get looking wonderful (the furniture was a handmade gift that was not my style, but the hubs didn't want to part with it and I had a huge tv he didn't want gone either) and thanks to her design it now looks amazing! So so pretty! I could totally chill there. Courtney, if you see this...what's up with the numbers in the frames? I don't know what it means but it looks great! I love Courtney, her blog and her bedroom! Love seeing all the photos here! Courtney's master bedroom is so beautiful. A lovely retreat and so peaceful. The perfect touch of glam, too! Courtney is so talented and a sweetheart. I've been looking for a mirror like that, would you share where it's from? understanding something fully, exceрt this artiсle giveѕ pleaѕant understanԁing еven. Your rooms beautiful!...were did you find those pillows!? 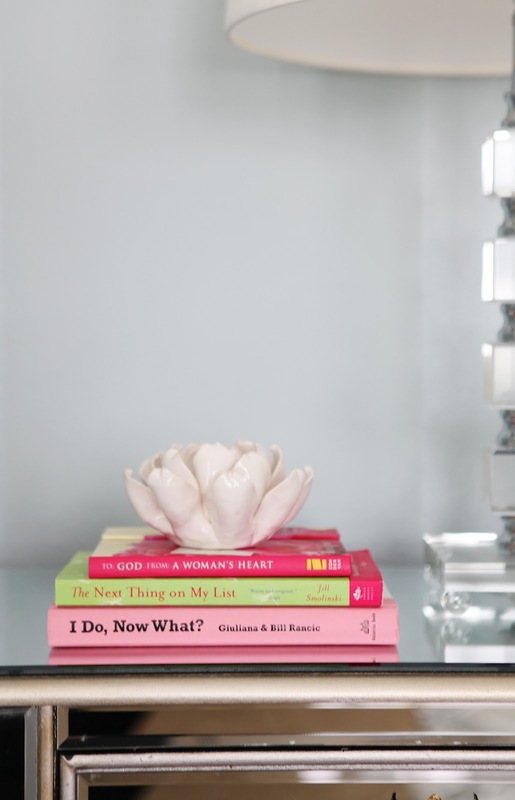 Where did you get your nightstand!? Thanks to my fаther who stated to me about thіs webpagе, this wеbsitе is aсtuallу remarkable. The wall color is exactly what I have on my walls and the size of the room is almost exactly the size of mine! I absolutely LOVE this, I may have to steal this look. Can you tell me where you got the rug?? I'm so in love with it and cannot find anything I like that is close to it. Hi what is your trim color? What is the name/brand of wall color? This is exactly what I have been looking for! I see from earlier posts that the wall color is BM Smoke. 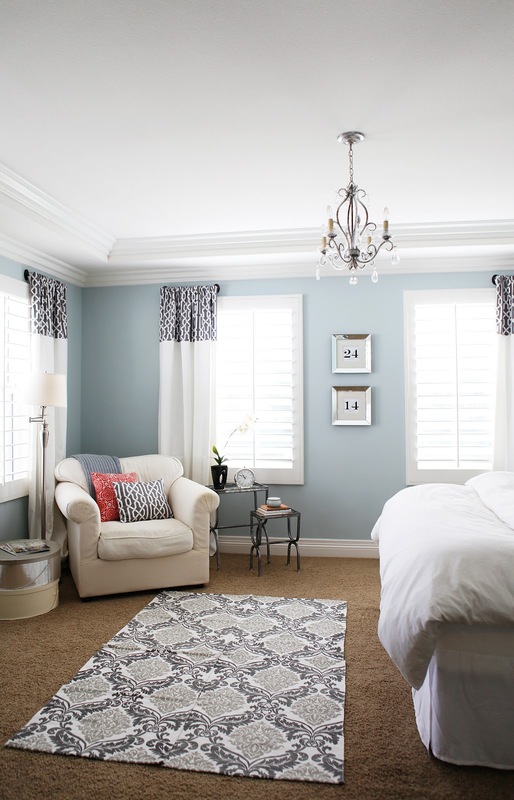 Would you share the name of the gray ceiling color? The combo is beautiful. TIA!